Imagine that you are in the market to buy a house, and have found the one you want. It is in the Los Angeles area, was constructed in the 1940s, and is on a hill. The replacement value of the home (excluding the land) is $500,000. You begin by asking yourself about your earthquake exposure: Is it too close to a fault? Is it in a landslide area? What about the soil? Will my family be safe in an earthquake? Can the house suffer serious damage or partial collapse? 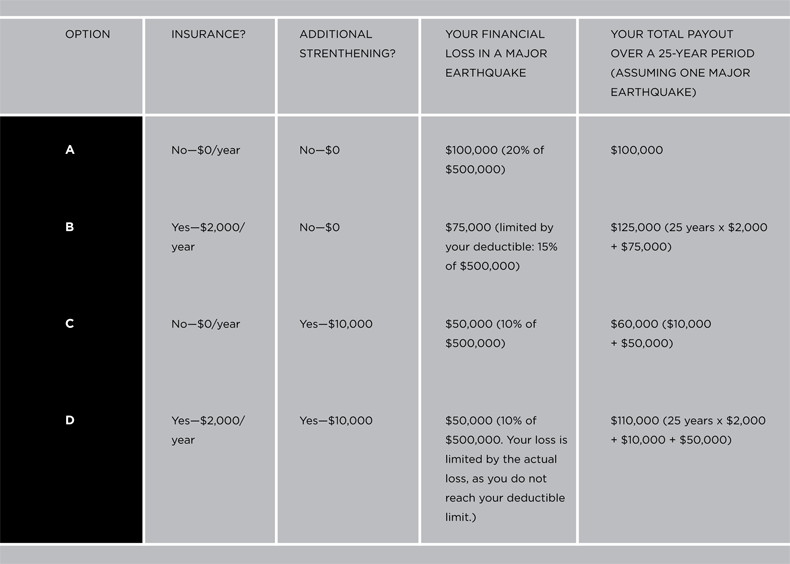 Should I buy earthquake insurance? Following the guidance of this book, you go through the process of answering these questions. Using the steps outlined on page 12 and the information given later in this book, you learn that, although your property is deep in earthquake country, you are 6 miles away from the nearest known active fault. You also learn that although your new home is on a hill, it does not suffer a significant threat of landslide, nor is it built on liquefiable soil. You do, however, learn that, due to the date of construction, the structure was never adequately anchored to the foundation and that there are vulnerable basement (“cripple”) walls in the crawl space. You also realize that that nice room on top of the garage that was added in the 1960s may pose a significant risk because the garage does not have strong enough walls to support it in an earthquake. You consult a structural engineer, who confirms that indeed you must do some strengthening in the garage to alleviate this risk. You also realize that the water and gas heaters are not braced appropriately and may pose a fire risk in an earthquake. The brick chimney, too, might be a collapse hazard. Through what you learn in this book, you decide that the earthquake risk to your home is manageable, and you decide to purchase the home. You should now develop a risk management plan. First, you determine what must be done to make the home safe for you and your family. You decide to anchor the house to the foundation, strengthen the basement walls, put a new steel frame in the garage, and retrofit the chimney. The cost of this work is estimated to be $35,000. You then assess whether you should obtain earthquake insurance or implement additional strengthening that would further protect your family against financial hardship. Through consultation with your structural engineer, you learn that additional work, including strengthening the first-story walls with plywood to prevent expensive structural damage, would cost you an additional $10,000. Your home insurance provider offers you the option of earthquake insurance. It is a member of the California Earthquake Authority (CEA), so you first consult the CEA Web site to investigate various policy options. You realize that the CEA protects against structural damage only. You look at the 15 percent deductible option ($75,000 in your case). Because of the work that you will do to keep your family safe, you are eligible for a “retrofit discount” (reducing the premium by 5 percent or about $100). Your premium is calculated by the CEA at $2,000 per year. After reading this book and consulting your structural engineer, you realize that with the $35,000 of necessary strengthening that you plan to do, your economic loss would probably not be more than 20 percent of the replacement cost of your home (or $100,000). In this case, with your deductible, you would be liable for $75,000 for structural repair. If you implement the $10,000 of additional strengthening, your loss probably would be no greater than 10 percent of the replacement cost (or $50,000). In this case, your loss would not exceed your deductible. You now have four options, as described in the table on page 14. After discussing the various options with your family, structural engineer, and insurance provider, you decide on option C because you feel that the $10,000 of additional strengthening will reduce your financial exposure and provide a safer home for your family, and because of the high deductible and low estimate of loss, insurance does not seem to be a cost-effective option. You implement your decisions. You anchor your foundation, strengthen your cripple walls, and, with guidance from your structural engineer, strengthen the garage structure, repair your chimney, and provide additional strengthening to your walls. You do not purchase earthquake insurance.